Lindamade » We Got Married! Two weeks ago, Paul and I got married (finally)! It was a wonderful, small ceremony & it was the day full of love that everyone said it would be. To keep it manageable and meaningful, we limited our guest list to about 50 people and did a lot of DIYing with the help of our wonderful families. 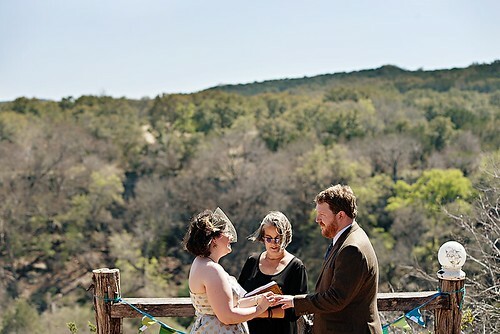 We got married at my Aunt Beryl+ Uncle Dean’s property in Round Mountain, TX, which overlooks the Pedernales River. It was an amazing view and we are still pinching ourselves that we got to have such a nice setting. I also think it’s pretty awesome that we’ll see this setting again and again over the years and remind ourselves of the vows we took. I made my veil using Craftsy’s Vintage Veils class, some etsy and random craft store finds, and silk thread that my grandmother gave me years ago. 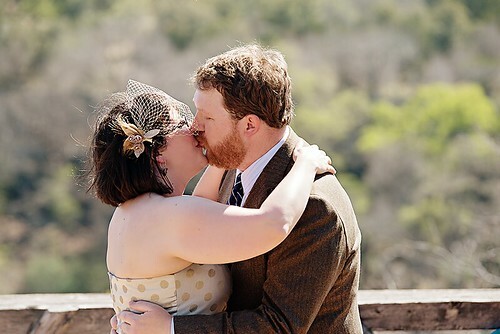 I also altered my dress about 3 days before the wedding, using info that I’m sure I gleaned from all of the conversations I had with Angela Wolf while producing her Tailoring Ready-to-Wear class. I crocheted my shrug using the Piped Petals Cardigan pattern I designed and Fiberspaytes Scrumptious (just over 2 skeins). I ordered the yarn from Craftsy early on, thinking it was white-ish laceweight, and it came in the color you see here– so I was disappointed. But, then I found my dress and the yarn was a perfect match! It all worked out wonderfully. I got to use some special buttons that I found at a Stitches show and cover my shoulders from the Texas sun, it was a win-win. My other favorite special touch was our “Ring Pillow”. We actually just used a ball of roving with a crochet hook to secure the rings, and it was perfect. I had been working on a crocheted pillow and I think it was Paul’s idea to just use the yarn instead. I figure one day I’ll spin this roving into yarn and make something meaningful with it, and I like that symbolism. Plus, I’ve never seen it done before. Bonus, the blue looks great with my sweet nephew’s glasses. 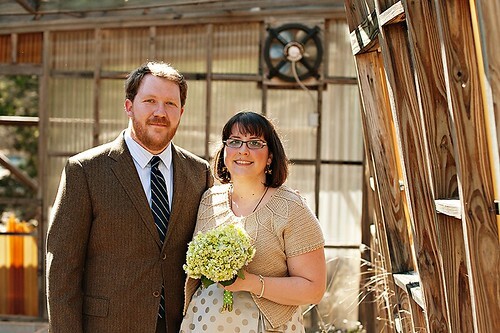 In addition to letting us borrow their awesome space, Beryl and Dean catered the whole thing. Amazing! 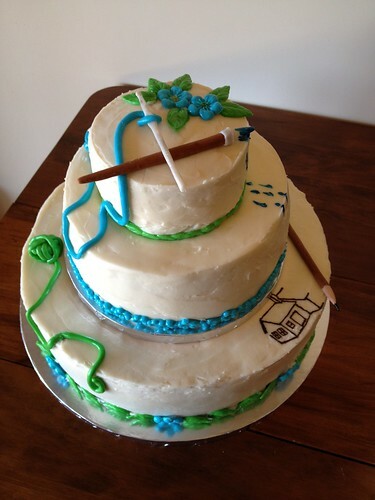 And– Beryl, an ex-bakery owner, made this awesome, super tasty cake for us– with the crochet hook representing yours truly and the paintbrush and pencil for Paul. It was all her own idea! We couldn’t have asked for anything better, she did a great job. (There was also a grooms cake featuring chocolate ganache, peanut butter and YUM. Paul is still missing it) . There were lots of other little details to the day, you can see a full sneak peak on our photographer’s blog HERE. Above- the last but not least thing I couldn’t resist sharing- a card box made by Paul’s mom, Elizabeth. Her embroidery blows me away, and I want to frame the box top to preserve it. We are so grateful for all of the ways everyone chipped in so we could have a really memorable day. If you are planning a wedding anytime soon, here’s my unsolicited advice to you: Do what you want and don’t worry about what other people say (even people you really trust who have your best interest in mind) and remember that it’s all about the feeling you create, not the stuff/details, okay? XOXO! Reminder: Photos in this post (C) Sleeping Owl Photography. Do not post, publish, print, etc without express written permission of the photographer. Thanks! Congratulations Linda! I have followed both yours and Paul's blogs for years. It was a beautiful wedding. Congratulations Linda! 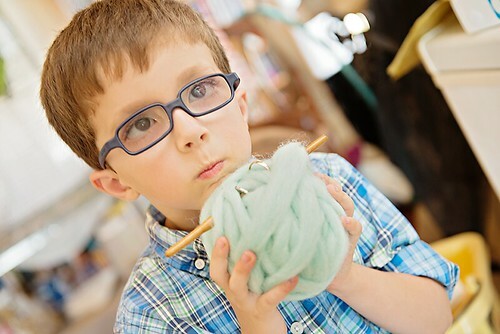 I miss seeing you at Yarnivore here in SA! Congratulations! 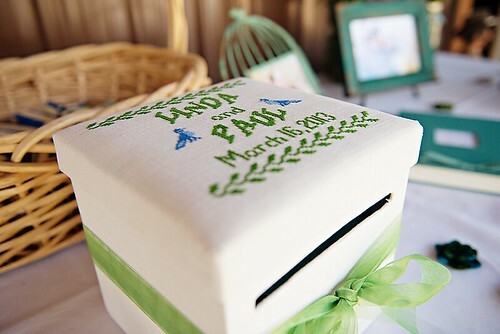 Small, DIY weddings are the best!